If you are searching for a way to enlarge the screen of your iPhone or iPad especially you are enjoying movies, photos or playing games. You need an AirPlay Receiver. 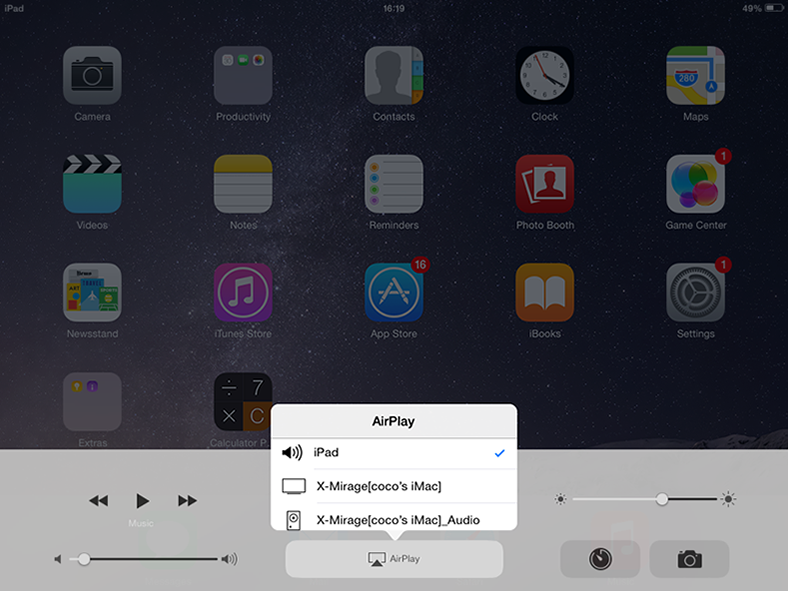 X-Mirage turns your Mac/PC into an AirPlay Receiver and mirrors your iPhone or iPad screen to the Mac/PC. With X-Mirage running on your Mac/PC, it is extremely easy to stream videos, audios, slideshows, or any airplay-enabled app from iPad/iPhone to Mac/PC screen, and then projector to wirelessly enjoy movies, stream a presentation from keynote or other apps, or show others how to use your app. This Airplay Receiver allows you to mirror multiple devices at the same time to compare different apps, different versions or the compatibility on different devices and iOS versions. X-Mirage not only makes it easy to stream contents or mirror iPhone/iPad screen to Mac/PC, but also allows you to record iPhone/iPad screen activities on Mac/PC. Whether you want to show off your iOS game skills or record a video tutorial to upload online, all you need to do is click the Record button, no matter you are using iOS 6 or iOS 7. X-Mirage for Mac runs on Mac OS X 10.6.0 or later and X-Mirage for Windows runs on Windows XP or later. Run it and you will see your Mac/PC in the available AirPlay Receivers on your iOS devices, tap this option and turn on Mirroring, the iPhone/iPad screen is mirrored to your Mac/PC and ready for recording.